#RedCarpetCat is Now for Dogs too! Dude! Did you hear? The #RedCarpetCat Emmy event is also including dogs this year. Gnarly, huh?! Tanner and I are uber excited that mom and Dogtipper finally got it right and added canines. What were they thinking?!!! We haven't heard what the prizes are for dog sorts, so we'll keep you posted on that. Meanwhile, you should be sure to RSVP so you'll be included in the RSVP drawing on September 19, and also to be eligible to win prizes at the party. There are even going to be pre-party prizes, so be sure to watch Event Barkers and AllThingsDogBlog.com for all the updates. It's awesome! I'll be Tweeting the night away, and probably fending off the ladies while I'm at it. Do ya think I need a body guard? Tanner! You're nominated! I'll be sharing @TheTiniestTiger's pics taken with the stars at the Emmy Awards Secret Rooms. Gracey is our sponsor (Shhhh....she's a cat). I don't quite understand that. If they're so secret then how come we know about them? Go figure! Yup! You read that caption right. 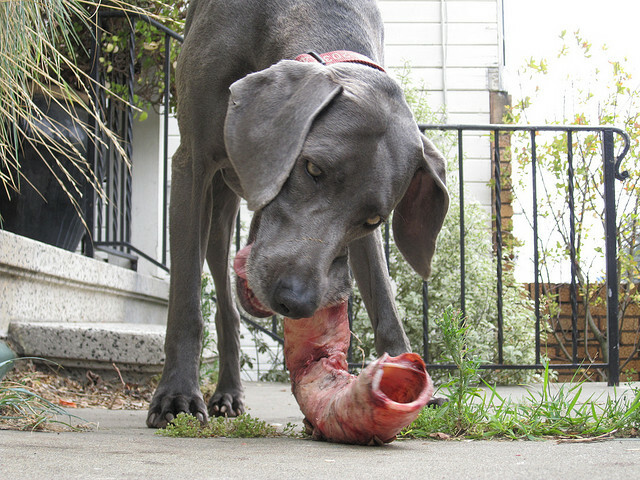 Raw feeding proponents feed their pets a wide assortment of fresh, raw meats and other foods, including bones. Tanner, Mom and I are neither for or against this method of feeding, but because it has been in the news, we thought we'd share some information, especially for those of you who are not familiar with the issues. The practice of feeding a raw diet to pets has been controversial for some time. What's the biggest concern? Safety from bacterial illnesses such as Salmonella, e-coli and others. And we're not just talking about us dogs. Their humans are at risk when proper precautions are not taken. Another concern is the issue of a balanced diet. You can't just toss your dog a raw chicken and expect him to remain healthy for a long life. He needs other nutrients, healthy fats, and a host of added vitamins, fiber and such. That's why companies in the pet food world have gotten into the game. There are a number of companies that make raw diets which stack up to the AAFCO (Association of Animal Feed Control Officials) guidelines. One of these is Nature's Logic. These diets are sold in frozen form and thawed at home for feeding to your pet. More on that later in this article. Many pet owners are diligent enough to research proper nutrition and create their own fresh, raw meals. Commonly, these owners create a large number of packages to freeze at one time, thawing one daily for feeding. With the right consultation on nutrition, this can be done in a healthful way. 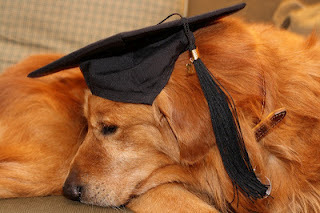 Without knowledgeable guidance, your pet may be looking ahead at a shorter life with poor health. That said, I'd suggest getting proper guidance from an expert to help you with the contents of your pre-packaged meals if you choose to go it on your own. Moreover, the feeding method is a big concern, and one that must be addressed for me to be thorough on this topic. (Don't I sound impressive for a Papillon?) Because of the bacterial risks, the feeding area must be cleaned thoroughly after feeding (hot water and lots of soap at a minimum), and your pet may need some cleanup as well. Consider that his paws and face, at a minimum, have come into contact with meat. He'll then be walking around on your carpet. Bathtime? Probably a good idea. Do you really want to handle this task daily? It's your call. Tanner would probably manage a good cleaning with a vigorous swim in the chlorinated pool, but me, I'd prefer not to partake in the pool unless Mom forces the issue. She does this occasionally to keep me on top of my game, but I'm not a fan. I wouldn't be fair if I didn't share that there are some health benefits to feeding raw, at least in the opinion of proponents. Raw food doesn't leave residues on teeth like grains, so raw-fed dogs generally have healthier teeth. This is widely-known to be one of the biggest reasons to feed raw. Healthy teeth = longer life. There are a number of other controversial reasons that many believe feeding raw is the way to go. We believe that many of these have value, but with their inherent risks as tagalongs. Again, it's your decision. Last week the American Veterinary Medical Association (AVMA) voted on a change to their stance on this issue. It basically involved how they recommend their members should advise patients on this topic. It is not a law, and does not change your right to feed you dog in whatever way you choose. It is simply the AVMA's opinion. Time will tell whether their opinion will be taken up by the FDA. I'm not going to go there. Basically, AVMA decided to advise members not to recommend raw feeding. Their reasoning was largely based on the health risks to both animals and the public. You can read the AVMA report on this vote to get the whole story. It's a short article that gives the basics, but includes links to additional information. We hope this is helpful to you if you want to investigate this more. Best wishes to you no matter which way you choose to feed your best friend, and feel free to leave your comments for the rest of our readers. PS--Don't forget to join us for #BarktoSchool, a Twitter Party with over $1000 in prizes. The big event is Sunday, August 12 at 8 PM ET, with prizes beginning promptly at opening. Don't forget to RSVP here to win prizes. We've been busily dropping photo hints that this review was coming, so I guess you know our noses have already done a pretty good job of checking out the goods. Truth be told, Tanner ate the biggest portion, but to be honest, he always does. He's a whopper at 70 lbs and me, Oliver, I'm a diminutive 10-pounder. Somehow that always makes me sound like a lower life form, but mom assures me I'm still plenty important.. As a matter of fact, I'm so important that I got this writing assignment. Take that, Tanner! BOL! ﻿﻿ I had to hold Tanner's paw and tell him I promised to use his thoughts in this review, or he was most certainly going to whimper like a puppy. So my disclaimer goes something like this: "All information in the following review is a combination of material gleaned from Nature's Logic, Tanner, Oliver, and even a few tidbits from Patches." Does that work? I thought it sounded real professional. Just to be clear, I'm going to give you some of the official info from Nature's Logic. This is the stuff mom likes to read. Like, for example, their food does not contain any synthetic nutrients. That's just fancy words for vitamins...you know, the stuff that makes us healthy, energetic and shiny. Nature's Logic makes their whole line of foods from 'whole foods' instead of stuff that was made in a chemistry lab. I though a lab was a dog, but my girl, Toni, tells me that it's a place where fake vitamins can be made--yuck! I much prefer real carrots and apples to fake ones, thank you very much! Tanner seems real impressed with the variety of different aminal (did I spell that right?) meats available in Nature's Logic foods. He tells me they make pet food using chicken, beef, venison, rabbit, salmon, lamb, duck, and sardines. Did I get them all Tanner? That's quite a list, huh? I'm going to have to go look up venison and sardines....not sure what they are. Can you help? Apparently since the Nature's Logic food has so much great protein, they decided to leave out some of the carbs that have less nutritional value. That was a mouthful I got from Patches. She hates carbs and cats don't eat much other than protein, so I understand her point of view. Me, well, I can take an occasional dog treat and enjoy the carbs included, but Patches tells me that Nature's Logic leaves out rice, soy, wheat, potato and tapioca. They explain this and some other stuff about our diets here. 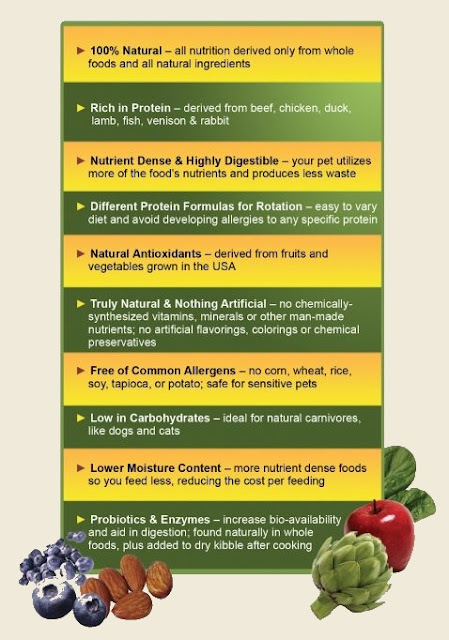 Sounds like the Nature's Logic folks got everything in their food that I like and even made Patches happy. That's no easy feat. What more can we say? Oh, yeah, I know what. Mom is helping the Nature's Logic folks get the word out with some help from Tiki and Irie's mom, Paris. We're throwing a Twitter Party called #BarktoSchool. You can join us by RSVPing at the link. Mom plans all sorts of training tips and nutrition info that's good for pet owners like you to know. She's also planning to share some info on a writer friend, Peggy Frezon, who has a bunch of books and a neato blog, Peggy's Pet Place. And another cool part is that she's also giving away a whole bunch of Nature's Logic, Walk in Sync leashes, great dog books, shampoo, training treats and more. Mom says there will be over $1000 in gifts for pets and their families. That's a lotta kibble! Anyways, if you want to join us for the party, you'll have to head on over the RSVP page and sign up. I guess if your pawprint is not on the list, you can't win a prize, so it's pretty important. I'll be there Tweeting too, so please say hello. My Twitter handle is @5MintuesforFido. See you then! Brooks and Kelly, owned by Peggy Frezon, are often a focus at Peggy's Pet Place. This is a delightful blog where you'll find all sorts of articles for the pet lover in you. Even Brooks, the adorable Golden snoozing at the top of this post, gets into the action occasionally with his column, Brooks Books. These book reviews are all about pets and pet books. Peggy has been writing about pets for years, having published many stories in the Chicken Soup for the Soul series. She now has two books of her own in print, as well. We're excited that she has offered to include an autographed copy of each in our Grand Prize for #BarktoSchool. 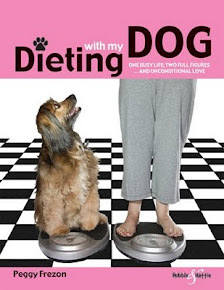 Peggy's first solo book, Dieting with my Dog, tells the story of Peggy's journey to eating healthier by teaming up with her dog, Kelly. It's inspirational and fun. You can read Peggy's guest post about the book at the link, over at AllThingsDogBlog.com. If you'd like to join Peggy and Kelly in the fun, pick up a copy at the link above; Amazon will get the book to you quickly. Tanner Needs a Bigger Scale! One last fun little thing we'd like to add. When Miss Peggy wrote her guest post for All Things Dog Blog, Tanner and I just had to try out the scale thing. You know you want to see these, right? Check out our Facebook photos and we'll share our silly pics. No peeking at the weights though. Shhhh! Oh, all right, then. I'll plug in Tanner's picture but you'll have to go to our Facebook page to see mine. Tanner couldn't fit his big self on the scale, so go ahead and laugh at his pouty face, but there will be absolutely No laughing at me!